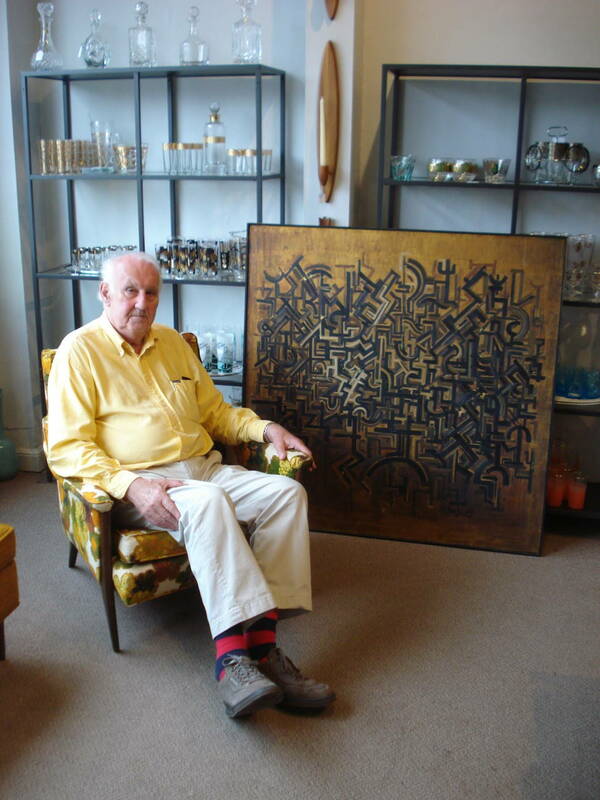 In February 2013, Mr. Vibe was out on a picking junket looking for mid-century treasures when he came across a striking copper and black abstract painting in a shop in the teaming metropolis of Genola, Minnesota (Population: 75). Not being an expert in art, he was unsure of what he had, but he knew he had something special. Mr. Vibe did some research on D.H. Spahn, but came up empty-handed. We placed the painting for sale at MidModMen+friends and admired it when we were in the store. Recently, Neal, one of the MidModMen, suggested we look up Dieterich Spahn to see if he could possibly be the painting’s D.H. Spahn. 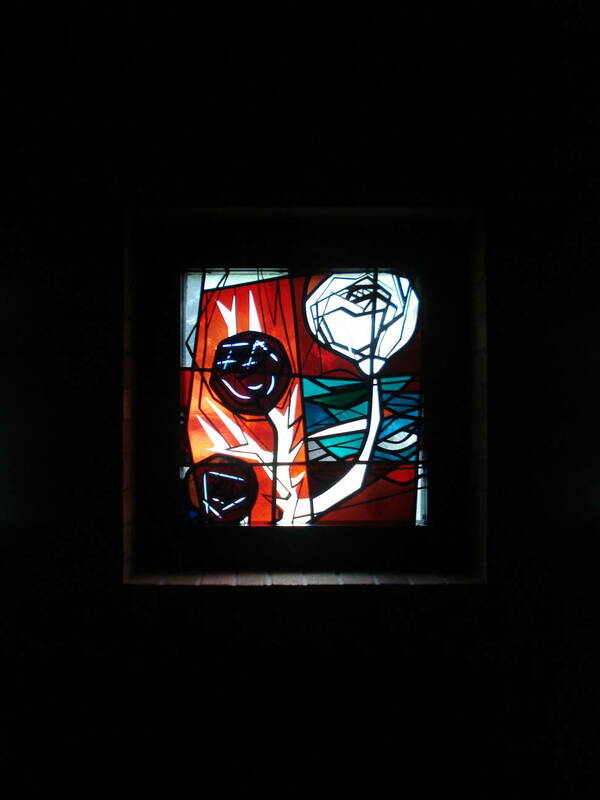 We discovered that Dieterich Spahn is a renowned artist who specializes in liturgical stained glass, having over 3,000 installations. 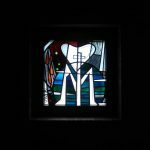 Although he specializes in stained glass, he is also a painter, with his works being held in collections internationally. 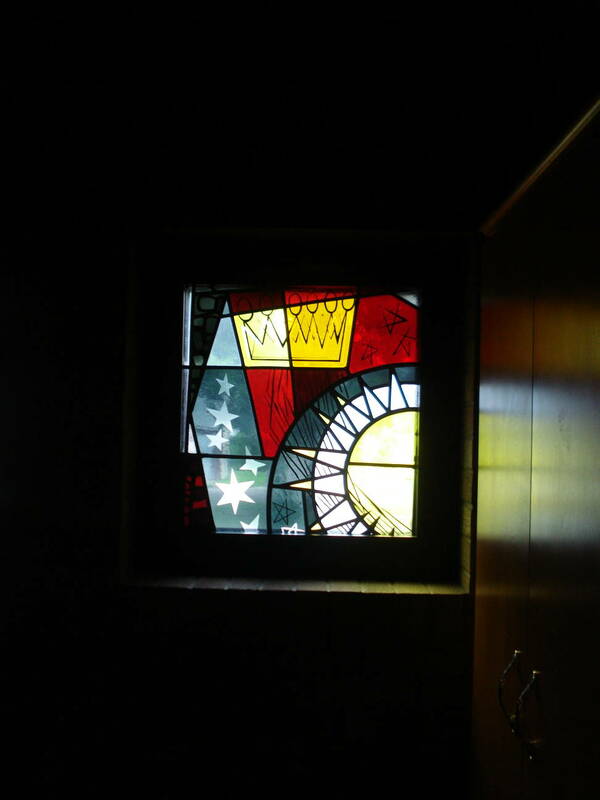 Mr. Vibe emailed Dieterich through his website and attached a picture of the painting, asking if he was the artist. 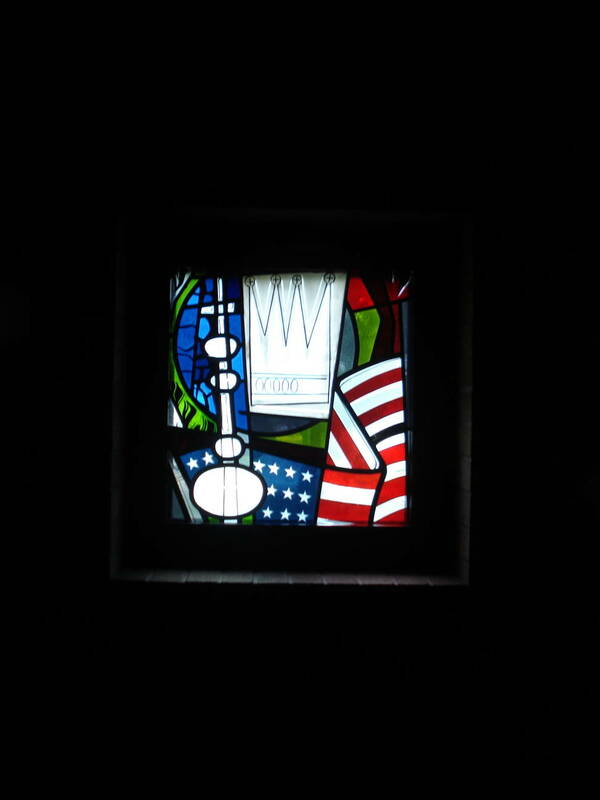 Dieterich replied that, yes, he was the artist of our painting and he remembered it. He then shared information about who he had sold the painting to and asked how it came to be in Genola since the last he had heard, it was in River Falls, Wisconsin. How it came to land in Genola, we had no idea. During Mr. Vibe’s conversation with Dieterich at MidModMen, our hometown of Little Falls was mentioned. 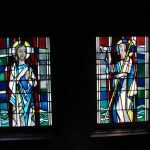 Dieterich said he had done work here at St. Mary’s Church. 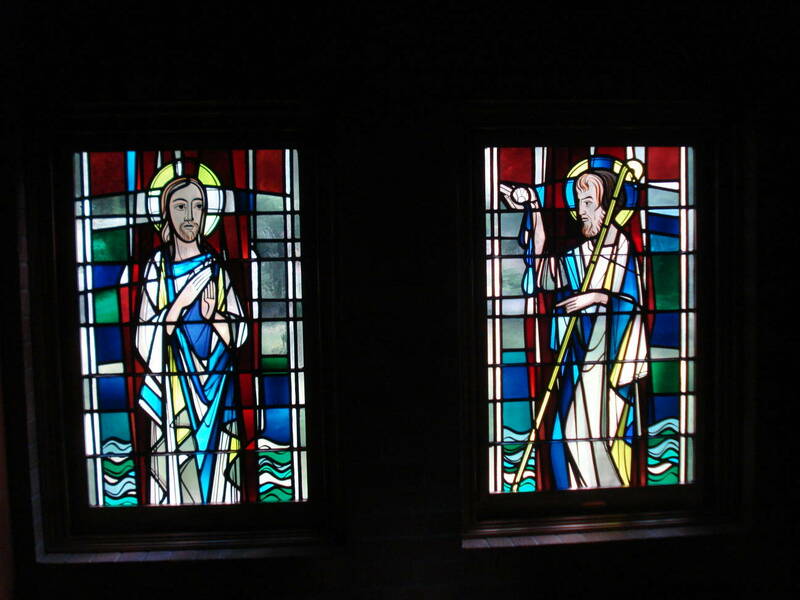 Peter Dohmen Studios had been contracted to design and install the stained glass, with Dieterich being assigned to design and make the stained glass in the baptistery, chapel, and above the main door. 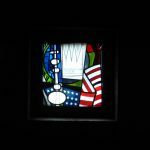 With thousands of installations around the United States, and one especially large one at Valparaiso University’s Chapel of the Resurrection, it was exciting to discover that some of Dieterich’s work is literally within blocks of our home. 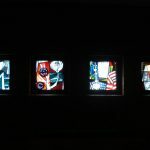 We truly appreciate the time Dieterich spent with us in sharing the history of his work and of our painting. 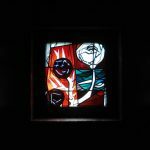 Check out more of his work by visiting the links we’ve added to this post. Jens Risom is well-known among mid-century aficionados as a designer of Danish modern furniture. 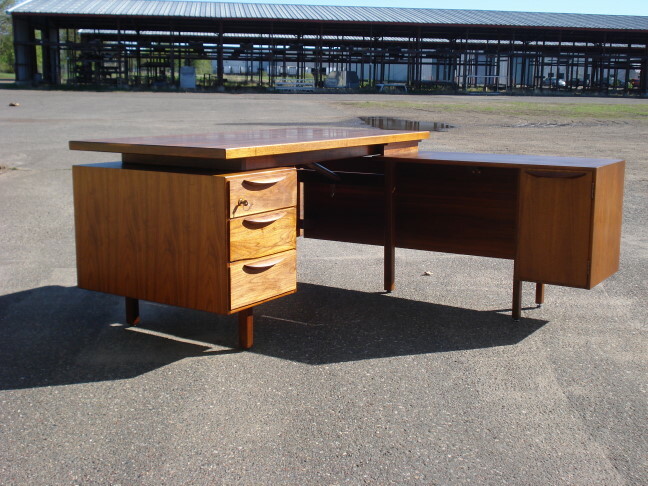 We at Mid-Century Vibe have acquired a lovely Jens Risom floating top desk with an interesting back-story. Jens Risom floating top desk. This walnut desk is secretary-sized with a return. It has three drawers, one of which is locking. (Yes, we still have the key!) The return has one door, which opens to reveal two adjustable file shelves. The entire desk features a wrap-around modesty panel (from the days when a secretary needed a little something to prevent people from looking up her skirt). 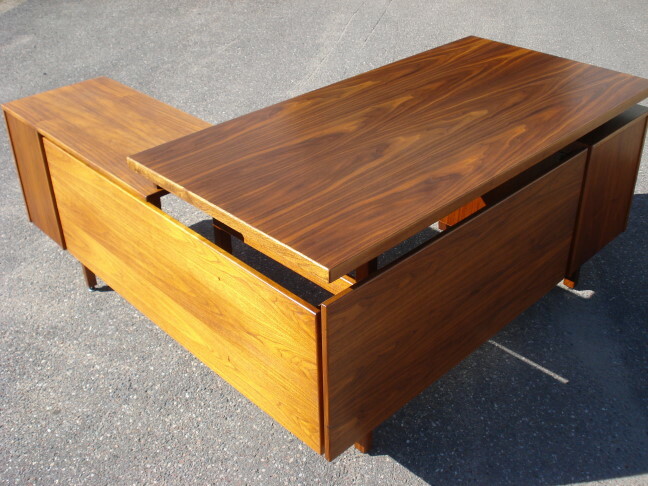 Mr. Vibe has refinished the entire desk with a generous application of Danish oil. 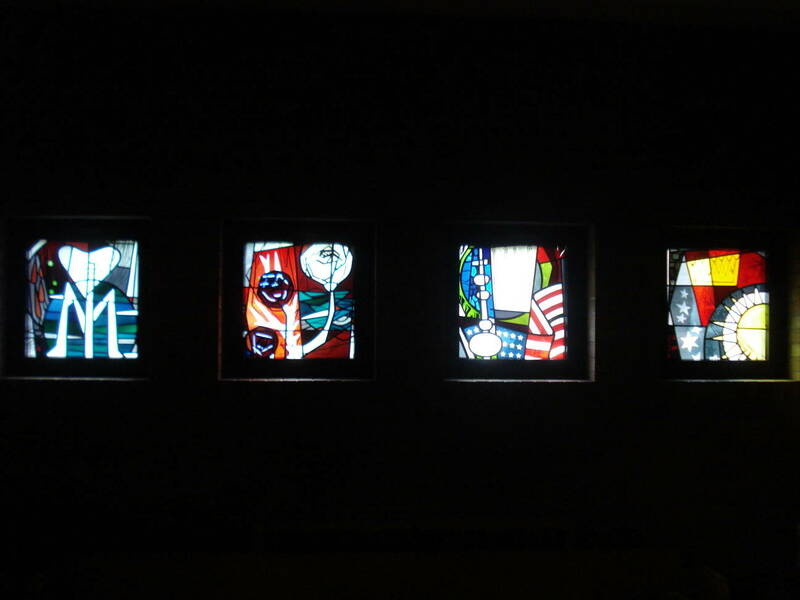 Modesty panels on front of Jens Risom desk. Note the book-matched veneer on the desk top. And now for the interesting back-story. Mr. Vibe found this desk at a small-town bank, a bank formerly known as American National Bank. In trying to track down whether the desk was original to the bank, Mr. Vibe found the original architecture firm after doing research at the Morrison County Historical Society (that’s a plug for Ms. Vibe’s day job!). 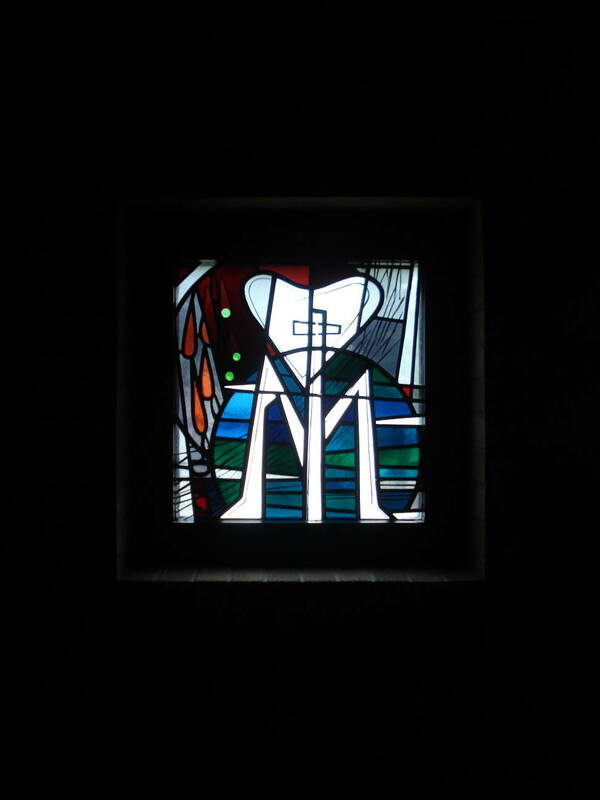 He paid a visit to said architecture firm and was astonished to discover that it had retained all the plans for the original bank, completed in 1959. 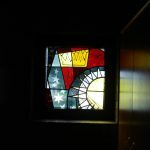 Not only did the firm still have plans for the building, it had kept information related to the renovation of the bank in the 1970s, including furnishings and wall coverings. Guess what was listed on the furniture list? This desk. Furniture specs for American National Bank, Little Falls, MN, 1977. 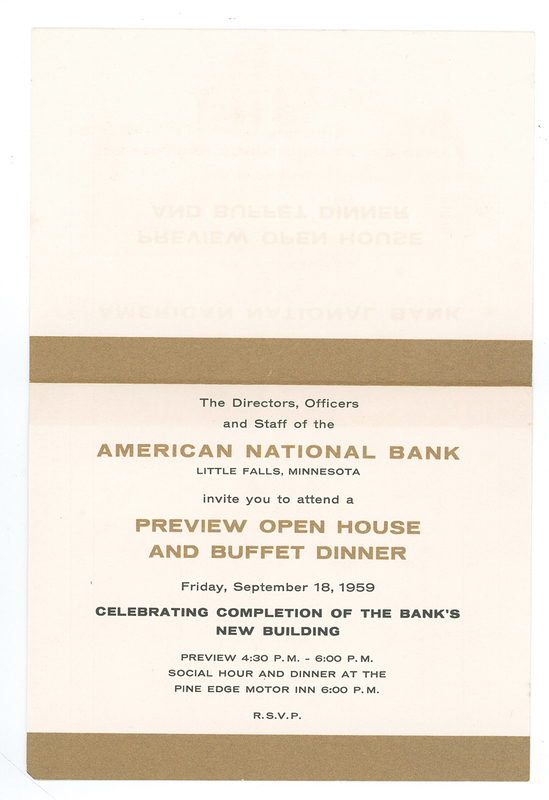 Mr. Vibe’s research also uncovered this invitation to the grand opening of American National Bank in 1959. 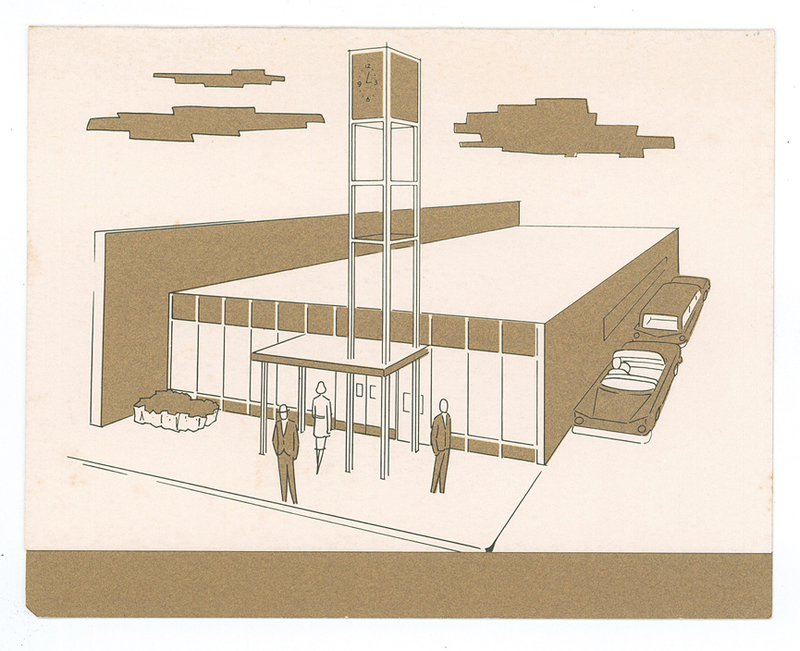 Artist’s rendering of American National Bank, Little Falls, MN, 1959. Courtesy Morrison County Historical Society. Invitation to grand opening of American National Bank, Little Falls, MN, 1959. Courtesy Morrison County Historical Society. This spectacular desk is available at MidModMen+friends, 2401 University Avenue West, St. Paul, MN. 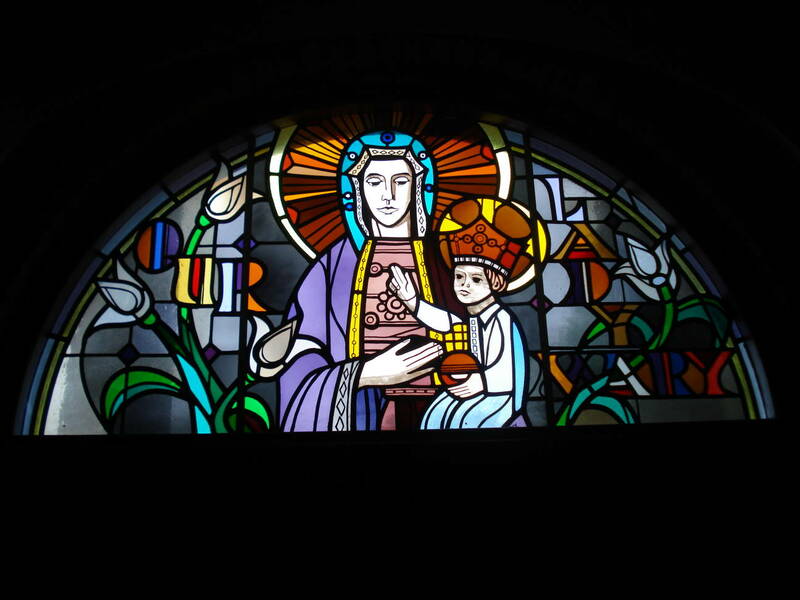 60″ wide x 30″ deep x 30″ high. 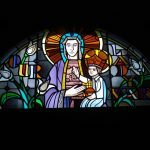 Return is 39″ long x 16.5″ deep x 26″ high. P.S. We also have the officer desk with officer credenza in the refinish queue. 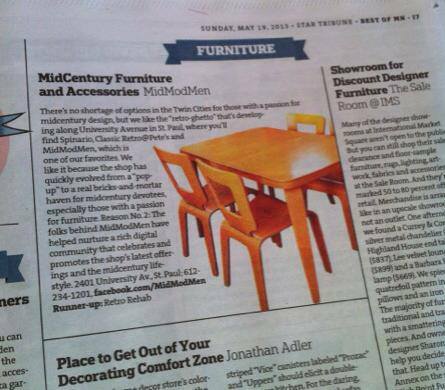 The StarTribune has recognized MidModMen+friends in St. Paul, MN, as their pick for best “MidCentury Furniture and Accessories” in the “2013 Best of MN” special section. We here at Mid-Century Vibe are very proud to be a part of MidModMen+friends (we’re the “+friends” part) and are honored by this recognition from the StarTribune. The article points out that MidModMen+friends is part of the “retro ghetto” along University Avenue. Businesses that cater to fans of retro furniture and accessories include Spinario, located in the Art & Architecture Building, Classic Retro @ Pete’s at University and Vandalia, and, the forerunner of us all, Succotash, around the corner from MidModMen on Raymond Avenue. Succotash has been in business for close to 20 years and owners Noreen and Paul have made us feel welcome in the neighborhood. Thanks to the StarTribune for this unexpected honor. Thanks also to all of the people who’ve supported MidModMen+friends by stopping in to the store, following us on social media and loving the mid-century and modern life.